I came up with this cheap design a while back using off the shelf bead containers and well, it seems to work pretty well. I came up with this because although I think the GroTube is great for medium to large size ants, I could not get them to work with the small Z. Xyloni i've been keeping. They just squirm their way out under the plate no matter what I do. I still love my GroTube for my F. Francoeri but despite two different units and a V2 unit, they still escaped...in large numbers. This stack screws together tightly and makes a nice tower. For ventilation I just drill a hole and secure some copper mesh with glue gun. Here I am hoping a colony will move from a failed GroTube that I setup in a box with test tube into a $3 Tower. I did this once before. Once the ants realize there is a moisture source in the tower and their test tube is dry, they move overnight. The one challenge I have had is feeding. These Xyloni are VERY aggressive about exploring any exits to the formicarium, so feeding time was always a mess. I have contrived to attach a glass jar connected by tubing and line the jar with Fluon. That's in testing now and required a $20 diamond-head drill bit. I also recommend a step-bit for getting clean holes in these bead stacks. You'll already be drilling into a curve so precision is important. Bottom line is that it's only $3 if you have everything you need already; drill, bits, cotton, tubing, glue gun and glue. I got the bead stacks at Hobby Lobby but have seen them at Michael's as well. I have some of the small ones and they also work ok, but the wider ones seem cleaner, have better visibility and are easier to work with altogether. I use the $3 Tower I made up. See it here. Couple other things I like about this setup. The tower is expandable and levels are replaceable. Obviously, with small species replacing a level can be tough, but I have done it. If there are enough levels eventually you'll catch them at one point with not many workers in a level you want to replace. In one of my smaller container models, I have a whole second tower attached with no water reservoir. They use the bottom level in that second tower for midden heap. From time to time, I just unscrew that lower level and put a new one on. Take the old one, clean it up and it's ready to go back into service. By adding multiple levels there is an almost natural moisture gradient created. The ants can place their eggs at different layers in the nest per their liking although these Xyloni seem to prefer the level with the cotton protrusion. That's pretty neat! Where did you get those? Nice one. That should stay hydrated for quite a while like that. I've gotten those containers from the Container Store too before. A store called Hobby Lobby. Michaels has the smaller ones sometimes. I like these larger ones because they are easier to work with. Very interesting. I can see this working well for larger species who get too worked up in a test tube set up. I have added a link to this thread on the Setups for Founding queens thread, near the bottom of the first post. You can add a picture to the Pictures of Formicariums link and add a link to guide them to this thread. I can see other people using this, cheap, simple, and the materials are readily available. I have seen these containers at the dollar stores for cheap many times, larger ones and smaller ones. I may have to try a few things. I can see adding a skif of sand, as the sand will stay moist, but not flood. This may be good for species who have issues with test tubes or for parasitic species that are being brood boosted. Couple of suggestions in case anyone tries to duplicate. lessons learned really. DO NOT put your interior holes right beneath the top hole in your lid. It makes it extra difficult to place and remove anything from your top feeding chamber. instead, offset it to one side and you'll have plenty of space to place things. Assemble your containers and twist them shut, then mark where you want holes to go. You'd be surprised the number of times you'll drill and then realize you put the hole on the same side for water as you intended for expansion or something and then you're stuck. You'll notice in the second picture I've used Drew's cotton glove finger over cotton ball trick and that I've tied it off. If you don't do this, the cotton ball in the lower water reservoir will start to disperse throughout the container and it just gets ugly looking. cut an extra long finger and tie it off. I don't recommend a twist tie(rust) or rubber band (erodes). You could use a cotton string I suppose. Drill CAREFULLY. You will not have a lot of room, particularly if you use large connectors like I did. You don't want to end up drilling through the threading that connects the containers together. You can actually make that work if it happens, but it is NOT ideal and makes replacement a real pain, well, impossible I would say. You might notice that I tried to use some tubing between layers. For small species that climb well, forget it. Waste of effort and time. If you have poor climbers then you've got to really plan and take note of my warning in the second bullet above. You'll have to put two together, mark, add the next, mark and so on, then twist it all together to make sure holes line up right before you ever drill. Put an expansion hole in somewhere, you don't want to have to drill into a populated container later. Think long and hard about how you're going to feed. I have found my Xyloni to be a nightmare. My fluon may be old, but it doesn't work on them very well and it doesn't work in the containers at all. So I've had to contrive an outworld solution. You might want to think about that when you start. Finally, buy more containers than you think you need. Last time I went, I bought all they had in the size I wanted. Reason is you will probably make mistakes but whether you do or don't once you see how well these work you will probably make a few more. These things are holding up pretty nicely. I'm really happy with the fact that I can easily refill the water container and even clean and replace it without ants escaping. Two of my Xyloni colonies have really grown in numbers. One already has three levels and seems well sized, the other i need to add a level, but that's another advantage. As they grow, just adding another tier is super easy. Cool. Feel free to ping with questions and let me know how it goes. Also feel free to improve and change to.suit your needs. So after seeing this post I just had to try it. Here is my attempt. Right now they are confined to the tower, but I plan to epoxy in a dirt floor into the box and give them an out-world. This is a pretty good design. What I would do is glue a perforated tube (3D printing would make this simple) to the floor of the bottom container (water tank), then insert a sponge into it. Insert a tile disk into the floor of the nest container, so when you screw it on, the sponge will always be pushing against the bottom of the tile in the nest container, keeping it hydrated. Tonight I performed a successful hydration replacement procedure. I removed the bottom water reservoir, cleaned it thoroughly and replaced the water with fresh. I then prepared a new cotton finger, carefully removed the existing one and replaced it, then reattached the water reservoir and reconnected the tower to the outworld. I didn't lose a single ant. Excellent! Best of luck. Be sure your tower is detached and outside of your out-world so you can perform water reservoir cleanings. To that point, make your connector to the out-world easily detachable and closable on both ends so you can do the cleaning at a comfortable pace. Well I am definetly going to have to steal this idea. This would work great. Well done. Still got your colony in this? Edited by T.C., February 21 2017 - 11:17 AM. No, they colony I had in there I gave to another forum member. He moved them right away to an aquarium setup. OMG, this is so cool! I've been trying to think of a formicarium solution that wouldn't break the bank, and would be easy to make, and this seems perfect! I'd just need some of those bead containers, some aquarium silicone, and some material to shove the cotton in, and I'd be set! They sell a multi-sized pack of those bead containers at JoAnn's: http://www.joann.com...6.html#start=23, which I think will be plenty to play with! 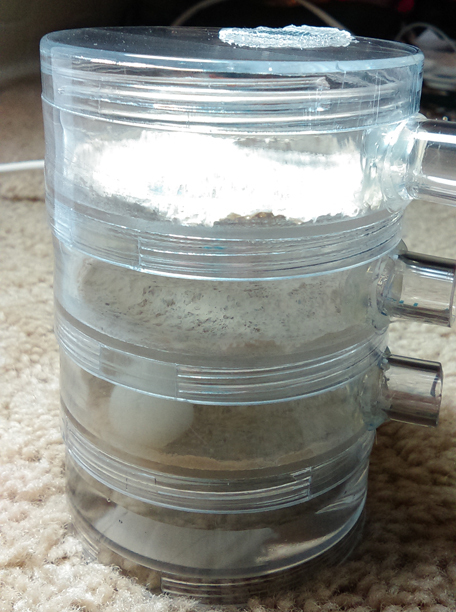 I think instead of having a separate water container though, I'll just drill a small hole near the top of the water section and use the syringe that came with my THA formicarium to fill it. 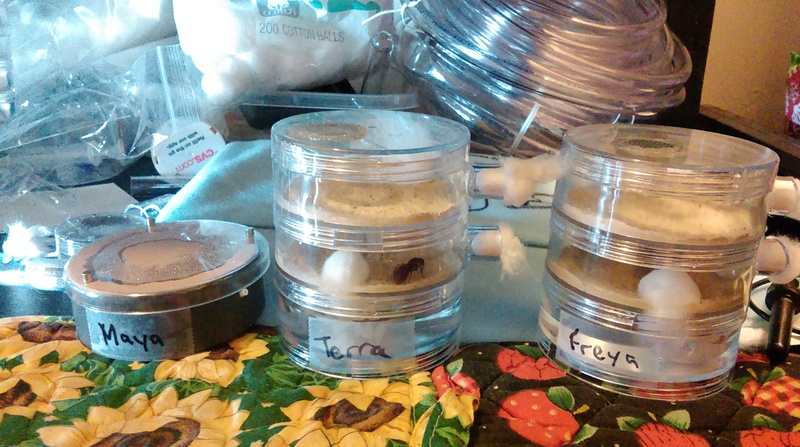 I don't have ants that are as escape-happy as the ones you were containing with this set-up, so having some tiny open holes here or there won't be as bad. Mine tend to be a bit jumpy though, so I think I'll line the bottom of each layer with grout. If I line up the holes correctly, I could probably even make little "stairs" between layers out of siliconed stones too. I have some extra aquarium pebbles I could use for that. Let's see if my obsession with making towers in Minecraft helps me plan my little ant towers, lol. Bless you for coming up with this idea though, this is great! Just wanted to let you know, I finished mine and they came out great! My queens are enjoying them much more than their old test tubes. I love how I can add/subtract sections based on what I need at the time. Thanks again for posting the tutorial! Really good design, I'll try building it with my friends in a few weeks! Very cool idea, I am not crafty at all and seem to spend all my money so i won't make it, but amazing none-the-less!